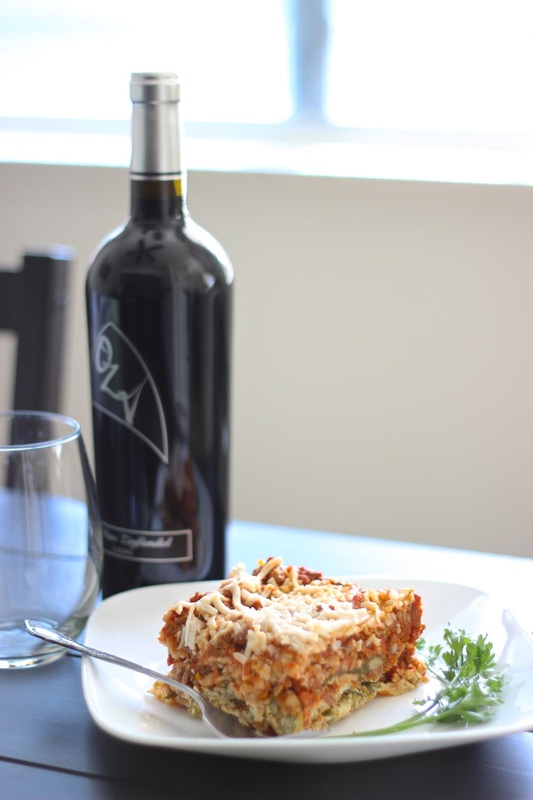 Hearty, Healthy Homemade Dairy-Free Lasagna! Looking for a warm, hearty, and comforting dish to cozy in on after a long day of work? This healthy and dairy-free lasagna is a hit! Might I also add that it is really tricky to photograph lasagna? :0 When it's hot it's a big sloppy mess and when it's cold it's stiff and kinda grey looking. Well regardless of the aesthetics that come across in the photos, this dairy-free lasagna is a flavor punch in the mouth and the dairy-free cheeses used in this recipe will have you fooled that there is actually no animal milk in the dish. See below for more photos and the recipe details! My dairy-free lasagna filling consists of nutritional yeast, fresh cilantro, fresh parsley, Parmela Bakery aged nut cheeses, Kite Hill almond milk ricotta, garlic and Himalayan pink salt. Absolutely fantastic! Preparation: Preheat oven according to lasagna noodle package instructions (usually 425 F). In a skillet, coat pan with preferred cooking oil (we use avocado oil) and brown ground beef with 3 cloves of chopped garlic. Add marinara sauce and set aside. 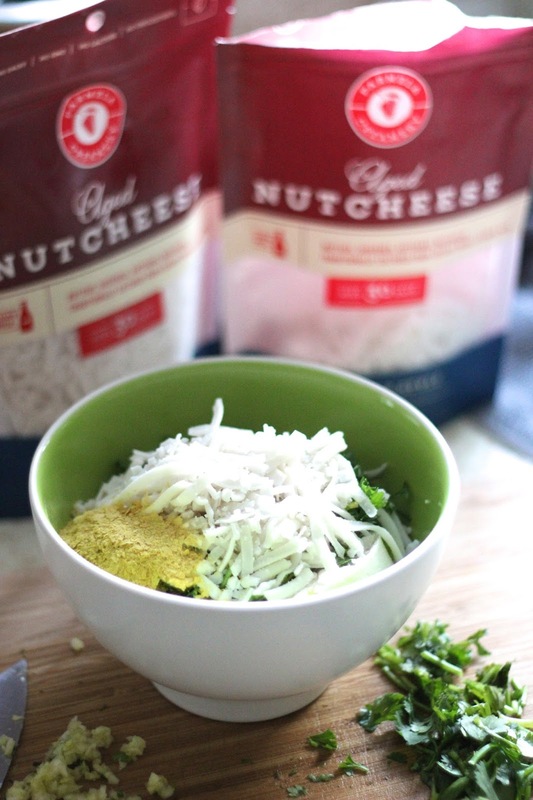 In a medium-sized mixing bowl, add ricotta, shredded cheese, nutritional yeast, remaining 3 cloves of chopped garlic, salt, cilantro and parsley. Mix well and add a tablespoon of almond milk or water at a time if mixture is too thick. Overall texture of filling should resemble same texture as cottage cheese. In a 9x13 in. pan, coat the bottom of pan with a scoop of marinara sauce and ground beef mixture. This should be a thin layer. Next place dry lasagna noodles on top of this layer. Then spread filling mixture on top of lasagna noodles. The entire filling should fit into this one layer. Then add another scoop of marinara sauce mixture on top of the filling layer. Spread evenly. Next add another layer of dry lasagna noodles. On top of this layer of lasagna noodles, add 4 cups fresh spinach. This layer will take up a lot of space, but will soften once another scoop or two of marinara sauce is added. The goal here is to portion out the marinara sauce so that enough is spread out through each layer of the dish. After marinara is placed on top of layer of spinach, add another layer of dry lasagna noodles. This makes for the last of 3 layers of lasagna noodles. On this top layer add the remaining marinara sauce and cover with foil. An age old secret with lasagna is to let the dry lasagna noodles cook in the seasonings of the sauces rather than boiling in water beforehand. This way, the noodles are ensured to be delicious and full of flavor! Place in oven for about 30-45 min (until noodles are soft when poked with a fork). Once noodles have completely softened, remove foil and add another layer of shredded cheese and let melt on top layer uncovered for another 5-10 minutes. Once finished, let cool and Enjoy!